Christopher Tappin is a retired buisnessman from Orpington, South East London. He has now been extradited to the United States over charges of conspiring to sell parts for Iranian missiles after a last ditch plea to block the extradition failed. Mr Tappin denies conspiring to export the batteries for Hawk air defence missiles and believes he is the victim of a “sting” by the FBI. “My father, as with any person charged with any offence, is unquestionably entitled to the presumption of innocence. Any official, elected or otherwise, who fails to recognize and apply that most basic principle, should be ashamed. “There is now much misinformation now being peddled, ie that my father is accused of arms dealing – which is not true. He stands accused of failing to get an export license to export controlled goods, albeit he was in fact the shipping agent for items he believed were destined for the automotive industry, acting under instructions from his client. Furthermore, no evidence whatsoever has been presented that my father “discussed the specifics of the plot” with federal US agents. My father intends to demonstrate the fallacy of the prosecution’s case at trial. “Judge Castaneda, presiding over the original US bail hearing, concurred that my father appeared to have a strong defence to the allegations. We were therefore stunned when bail was denied. The US prosecutor has throughout contested my father’s bail application, claiming that he’s a danger to the community and at risk of fleeing the jurisdiction. Yet for 2 years my father has fully complied with each and every condition of bail that was required of him by the UK courts. There is no reason at all to conclude he is either a flight risk or a danger to anyone. “Our family asks for nothing more than the support of the UK government in securing bail now my father is in the US. The irony is that a British citizen is being accused of being a “flight risk” by the US in part because he did nothing more than exercise his lawful right to resist extradition in the UK. Instead of acknowledging such, the Prime Minister’s quoted comments today suggest he is acting as Judge, Jury and executioner. We are extremely disappointed by his comments. Watch the full speech, delivered to the European Parliament after Britain voted to leave the EU last year. First let me stress that the Common Fisheries Policy (CFP) has been a complete environmental, economic and social disaster and UKIP uses what say it has in the EU “Parliament” to vote against discards and protect British fishing. Where Mr. Davies claims that UKIP and the political group we are attached to, does not have its views represented on the CFP reform is simply not true. 1. When Mr. Farage cannot attend a fisheries committee meeting there is always a substitute member who takes his place. So the vote we are given on the committee is used by a nominated substitute and not wasted. 3. The CFP reform comes in a number of different legislative proposals. One of which was authored by an MEP of our political group. So to say our group has not been involved in CFP reform is very naughty to say the least. 4. We have a dedicated UKIP staff member who follows very closely all legislative proposals which come through the fisheries committee and we most certainly table amendments and seek to defend British fishingrights where we can. For example – Mr. Farage will be tabling amendments on shark finning, which will close the loopholes in EU law and help ban the awful practise outright. What Mr. Davies fails to mention is that MEPs have very little say over EU legislation. The only people who can propose, repeal or initiate reform of EU law is the EU Commission who are not elected at all. It is true MEPs can make amendments to legislation but that needs agreement with the EU Council and also, if a bill reaches a second reading, the Commission can have such amendments removed fairly easily. The UK has given up 100% of fishing regulation to the EU. The MPs you elect can’t do anything about it, theUK government can’t do anything about it, the MEPs you vote for are powerless to initiate any reform. No one you vote for can initiate or substantially change any CFP reform. The only way we can deal with the problem of discards is by taking back control of fishing policy and instituting policies to end such waste – which means kicking the EU out of Britain. • Abandon all EU quotas and strictly forbid the shameful discarding of dead fish – sometimes up to 70% of catches or 800,000 tons p.a. Many thanks to everyone who has sent me letters regarding the disastrous and morally bankrupt Common Fisheries Policy. This is something which I have been campaigning against for many years and as a Sea Angler is a policy very close to my heart. Thank you for your email regarding reform of the Common Fisheries Policy (CFP). The CFP has, quite frankly, been an economic and environmental disaster in which the UK fishing industry and fish stocks have suffered terribly. The draconian quotas system, forced on to us by the EU, has led to the throwing of dead fish back into the sea. For example in the North Sea, nearly half of all fish caught are thrown back dead. That is nearly one million tonnes a year. But the question remains what we can do about it? As I’m sure you are aware, the UK gave up regulation of the fishing industry to the EU. So not one MP you or anyone else elected in the UK can propose or amend law regarding discards or the wider fishing sector. The government repeatedly comes out against discards, as was seen by the recent “fish fight” (CFP reform) campaign led by Hugh Fearnley-Whittingstall. What is laughably called the Fisheries Minister, supports Hugh, but can do nothing about it. So Hugh went to the top. He met with EU Commissioner Damanaki (Fisheries portfolio) and for the cameras, she said that “you the people can make this change” – when in fact this isn’t true. The EU parliament has very little say and is easily ignored by the Commission, which is the only body that can really regulate. The UK MPs you elect can’t do anything about it, the UK government can’t do anything about it, the MEPs you vote for are powerless to initiate reform. No one you vote for can initiate or substantially change any CFP reform. It is at this point I have to ask the question, what sort of democracy do we live in when we can’t change a policy by the ballot box? This gets to the core of my position. The only way we can deal with the problem of discards is by taking back control of fishing policy and instituting policies to end such waste – which means kicking the EU out of Britain. But this is just the tip of the iceberg. There are more and more areas becoming an EU “competence”; look at environmental legislation and the effects of bio fuels on developing countries, look at the Common Agriculture Policy – one disaster after another and there’s nothing we can do about it because the Commission calls the shots, and we can’t vote them in or out. As a member of the Fisheries Committee in the EU “Parliament” I have made many speeches against discards. I shall, of course, vote against the quota system any chance I get, and will continue to speak out against discards as much as I can in the media. Nigel Farage spoke in the European Parliament in Strasbourg today, offering his condolences to those affected, and drawing attention to the political decisions that have led to European countries with massively ghettoised populations. Policies such as swift mass migration, as well as Europe’s foreign wars, have overlapped with what Mr Farage called a “civil war within Islam” to create the scenario that sadly played out on France’s streets last week. 34 year old mother of one, Angharad Yeo, is one of the latest in a growing number of defections to UKIP from the three parties in Westminster. Her mother Harriet Yeo is Chair of Labour NEC. Angharad Yeo, a long term Labour supporter and campaigner who helped the party in elections since the age of 17, came to the conclusion after the recent Police Commissioner vote that UKIP better represented her views. “The main parties are simply not listening when it comes to matters such as immigration. It may be somewhat a taboo subject but it is vital that we talk about it. It is especially valid in Ashford which has suffered from a huge influx of migrants as one of the first ports of call in the UK. “My daughter attends school in Ashford and I have benefited from maternity and healthcare in South Ashford. I have seen for myself the strain put on local services by the swelling population. It is not a question of race or creed, but of numbers. I am of Saudi origin, and it infuriates me when people paint those of us who believe immigration must be better controlled as in some way xenophobic. 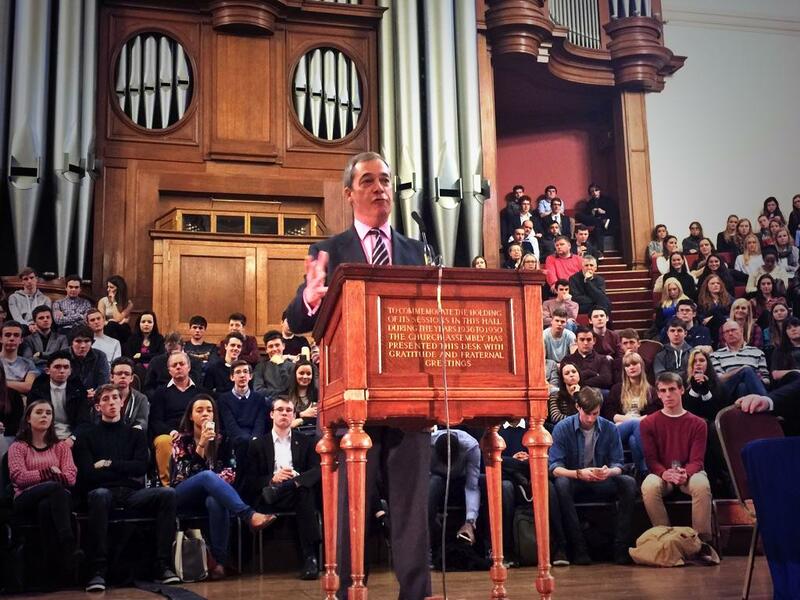 “I decided to join UKIP as I strongly believe that the two party system we have in the UK is not working. I was brought up in a Labour voting family and my mother still works for the party as Chair of the NEC. But I came to decide neither Labour nor the Conservatives really represent the people anymore. They have become unaccountable to their core voters, and important issues that really matter to hardworking taxpayers are ignored or brushed under the carpet. “The euro Titanic has hit the iceberg and there aren’t enough lifeboats” said Nigel Farage in Strasbourg today (13th June). During a debate where the EU President Hermann Van Rompuy was notably absent after assuring MEPs that the crisis had turned a corner, Mr Farage revealed the disastrous policies which have now been implemented to stop Spain defaulting. IN the 12 years I’ve been an MEP I have received a lorry load of communication from constituents, asking me to support this and oppose that. But not one calling for me to support, or indeed oppose, gay marriage. Why is gay marriage suddenly in the spotlight? It was in no manifesto. It may be vital to a minority of people, but not to the wider public. A recent ICM poll reveals that 14 per cent of people thought that the Government should prioritise the issue but 78 per cent felt that it has more important matters to address. It’s puzzling. Why on earth is David Cameron pushing this so hard? Why has a consultation been launched on the issue? Not making the change is not an option, apparently. Why is he opening a new front in his war against his traditional support? I bumped into the gay rights campaigner Peter Tatchell a few days ago. “Why now?” I asked. Smiling, he told me that it was because he had a case going to the European Court of Human Rights. Of course, stupid me, why didn’t I think of that? There just had to be a European angle. Whatever one’s view of the issue, the case they make is well constructed. They have put together a team of complainants to the ECHR, some straight, some gay. They highlight the difference between banning marriage for gays and civil partnerships for straight couples despite them being to all intents and purposes equal in law. It has been with the court since last year. The fact that Cameron has suddenly taken up this cause, which has not really been on the horizon at all, suggests that the case is heading towards an imminent hearing and his legal advice is the same as mine. The last thing he needs at the moment is to have the European courts declare our law discriminatory again and demand it be changed. It would show him weak and ineffectual. It would then appear that he was only espousing gay marriage because the court has said so. The Tatchell express has been spotted coming down the tracks and Cameron has decided to get out of its way. That he is jumping into the path of another train composed of his own core support means nothing to him. The chief whip is saying that there will be a free vote on this. Maybe so, there was one on prisoner votes after all, but it is meaningless. For in exactly the same way it doesn’t matter what our politicians say and do, when the European Court rules, we must obey. In this world where we are governed by the ECHR, one has to ask, is nothing sacred? The European Union is a political union with total free movement of goods, services and labour; that is a fact. We were told to support entry to the EEC for reasons of trade with little or no mention of the free movement of people. None of this mattered so much when the EU consisted of countries like The Netherlands, France and Germany who have comparable standards of living. But in 2004, all that changed with the enlargement of the EU to include most of Eastern Europe. All of a sudden anyone from Poland, Lithuania or Slovakia could come to live and work in this country. The enlargement of the EU was supported by Labour, the Lib Dems and the Conservative Party who continue to avoid the elephant in the room whenever immigration is discussed. That elephant is simple: as long as we are in the EU we can have no control over who comes to live, work and settle in the UK. The latest report on immigration trends brings into the open this fallacy that the coalition are going to control net flows into this country. Despite the Conservative election pledge of reducing net immigration ‘from the hundreds of thousands to the tens of thousands’ they have been advised to control expectations rather than the figures. Whenever there is a debate, all the political establishment talk about is the non-EU figures over which we still have some control. The initial estimate of 13000 people a year coming to the UK from Eastern Europe was in fact based on a German study and jumped on by the government as a way of protecting their decision. It was clearly never going to be the case given the generous welfare state we have in this country and our language being our greatest export. For where else were young, English speaking workers going to come but a country which offered them a free health service, decent wages and housing? Not to mention the child benefits which can be sent to their country of origin regardless of where those children actually live. Immediately after the accession of these countries the numbers coming to the UK from Eastern Europe were approaching 200,000 a year and a study of those living in Britain shows 750,000 people were born in these countries, including half a million from Poland alone. Since then, instead of learning from this, we’ve had two even poorer countries join; Romania and Bulgaria. And still it goes on, with the coalition and opposition parties supporting Turkish entry to the EU which will allow over 70 million Turks the same rights under EU law as anyone from Britain. Hungary is offering millions of ethnic Hungarians living outside its borders EU passports which could result in about 500,000 moving to the UK. There are also one million Moldavians who have been given Romanian EU passports allowing them free movement across the entire EU despite their country not being a member. Why should Romanian and Hungarian politicians decide who can come to the UK but MPs in Westminster can’t? Damian Green, immigration minister, is not being honest when he says the government will impose controls on all immigration routes into the UK. So what have the results of this mass migration been? Well, in simple economic terms it means a dramatic rise in the supply of labour which, without the resulting increase in the number of jobs, leads to a fall in wages and employment. And a rise in unemployment not only means a rise in our benefits bill but less money being invested in new businesses to create more jobs and in essential public services such as defence and policing. With the failing Euro and the British economy out performing many countries in the eurozone we will continue to see the trend of the last few years: non-EU migration falling and EU migration rising. The immigration that we have absolutely no control over is the very area we need to control and yet our government seem unwilling to even discuss it. The opportunities our wealthy political classes talk about may be true if you would like a cheaper au pair or chauffeur. But it is not the case for the majority of us. This conspiracy of silence about the true nature of immigration; the effects of the full entitlement to the NHS, schools and housing for anyone in the EU is beginning to be chipped into by those who do want a debate. When Julie Spence OBE, the former Chief Constable of Cambridgeshire Police, spoke out about the impact on the police force of Eastern European migration the Home Office blamed her for picking these people out, even though her statements were based on facts. And yet in homes and pubs up and down the country, the men and women of this country have been saying that something is not right, that they are not happy with the current situation. In 2007 a poll conducted by ComRes found that 80 per cent of people would vote to leave the EU if it meant they could control immigration. If you want the British people to decide who comes to live, work and settle in this country then the choice is clear; we must leave the EU.